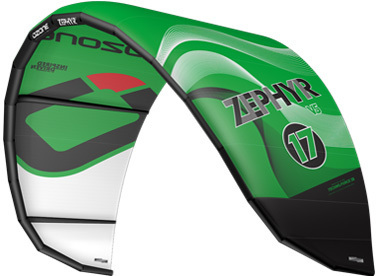 The Zephyr was a ground breaking kite and without doubt it was the first light wind specific kite on the market that delivered both performance and handling, the likes of which had never been seen before on such a big kite. Other brands witnessed the success of the Zephyr and followed with light wind specific kites but the Zephyr remains the benchmark. We are now proud to bring you the next generation Zephyr, which continues to set the standard for light wind riding. The all new Zephyr is a design that incorporates elements of the performance dominating Edge along with the ease of the previous Zephyr to fly and relaunch. The improvements are instantly noticeable for riders accustomed to the previous Zephyr. The new model has a crisp powerful feeling and a very direct positive bar feel, with instant power delivery compared to the previous model. The new plan form, profile and sail tension help control the surfaces which gives the Zephyr a more cohesive feel. All these performance enhancements make it perfect for practicing new school moves or just cruising, kite loops are made easy and the boost is impressive while floaty. Since introducing the Zephyr and more recently with the race scene explosion we have increased our knowledge and understanding of light wind kiting. During our R&D of the new Zephyr we found that we could ride in incredibly light winds if we took a foil or race board. These styles of board have so much performance and so little drag that if you just get moving then the apparent speed the kite generates is simply mind blowing and you can be powering upwind in almost glass smooth conditions. There is no question that the new Zephyr is going to get you out there enjoying whatever aspect of kiting you prefer on the day.